Hello, readers! I have another press release to share with you from OPI. This is for their new Infinite Shine Gel Effects line. 30 new colors, plus a base and top coat that should give you the shine and wear of gels without curing from a light. Take a look at the info I received below! OPI, the leader in nail color innovation, announces the release of Infinite Shine Gel Effects Lacquer System, offering the rich color, intense shine and lasting wear of gels – without the need for LED-light curing or soak-off removal. Available in 30 new shades (plus Primer base coat and Gloss top coat), Infinite Shine utilizes a three-step system to deliver a high-shine classic crème finish for nails that lasts up to 10 days. OPI is guaranteed only when purchased through authorized professional beauty outlets and prestige stores, not from a drugstore, supermarket, mass outlet or other unauthorized source. For more information, please call Tractenberg & Co. 212.929.7979. 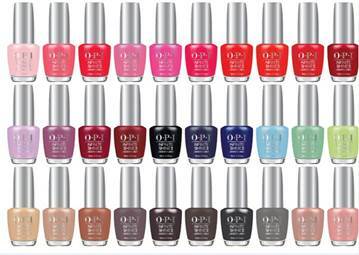 Follow OPI on Twitter and Instagram @OPI_PRODUCTS and go to Facebook to become a fan!